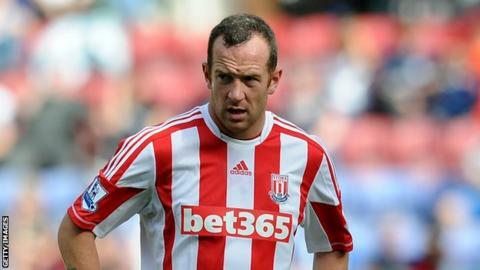 Stoke City's Charlie Adam says first-team football was the reason behind his deadline day transfer from Liverpool. Adam, who had fallen out of favour at Anfield before his move, made his first Premier League appearance since March in the Potters' 2-2 draw at Wigan. When asked why he left Merseyside, Adam told BBC Radio Stoke: "It was football, I want to play every week. "As a footballer you want to play football. When an opportunity like this comes along it's hard to turn down." Adam continued: "It's a well-established club in the Premier League and hopefully we can be successful in the next few years." The 26-year-old was one of three midfielders to complete their moves to Stoke in the final two days of the transfer window, alongside American Maurice Edu from Rangers and Frenchman Steven Nzonzi from Blackburn Rovers. The trio followed fellow midfielder Jamie Ness, winger Michael Kightly and defender Geoff Cameron through the club's door during the summer. And the Scotland international believes that Potters manager Tony Pulis has assembled a strong squad at the Britannia Stadium. "I'm looking forward to working with Pulis. He's passionate and that rubs off on the lads as well," said Adam. "Everyone that takes part in the game works ever so hard and there's good quality in the club." The former Blackpool and Rangers player will now join up with the Scotland squad ahead of their World Cup qualifiers against Serbia and Macedonia. However, despite being excited by the prospect of joining up with his international team-mates, Adam admits that he would prefer to be spending his time settling in at his new club. "I'm looking forward to going to play for Scotland, but when you join a new club you just want to keep playing," he added. "If there was another game next week I'd be delighted to be here and playing, and hopefully trying to put in the performances we did [against Wigan]."